Sokoto State Commissioner of Information and Chairman of PDP Publicity Committee, Gubernatorial Campaign Council, Barrister Bello Muhammad Goronyo, has defected to the All Progressives Congress (APC). A statement by the state government directed the permanent secretary in the ministry to take over. Goronyo announced his defection during a APC governorship rally in Wamakko Local Government Area about the time the ruling PDP in the state was holding a mega rally at the hometown of Governor Tambuwal. He said at the event, “I am back into the fold of the APC. 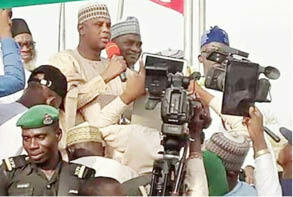 Senator [Aliyu Magatakarda] Wamakko is my able and dependable father. He is a just, honest and transparent leader. “This day is very historic for myself, my family and all my political associates. I have admitted making mistakes, but I should be forgiven. “I hereby promise to work assiduously to ensure the success of the candidates of the party at all levels during the forthcoming general polls,” he said. Senator Wamakko (APC, Sokoto North) welcomed Goronyo back into the party, describing him as a true and loyal son. “I am sincerely elated with this happy development,” he said. The APC governorship candidate in the state, Alhaji Ahmed Aliyu Sokoto, also lauded the former information commissioner.